After you’re done visiting the famous Catedral de Barcelona and the mountains at Montserrat National Park, you may be asking yourself what else there is to see in northern Spain. 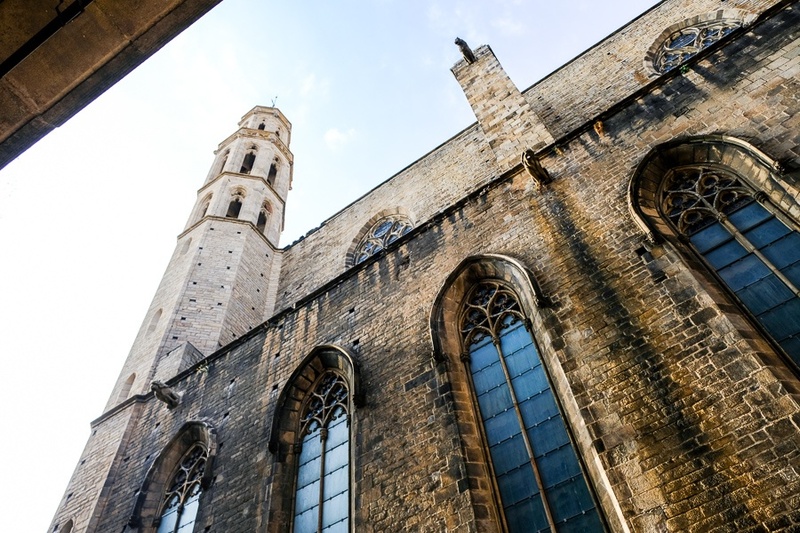 What many tourists don’t know is that Barcelona has another medieval church by the name of Santa Maria Del Mar, and you can visit it for free at certain times of day. I don’t know if I enjoyed this one quite as much as other stuff in the area, but it’s easy to tack onto any Barcelona itinerary and the architecture is still pretty great. 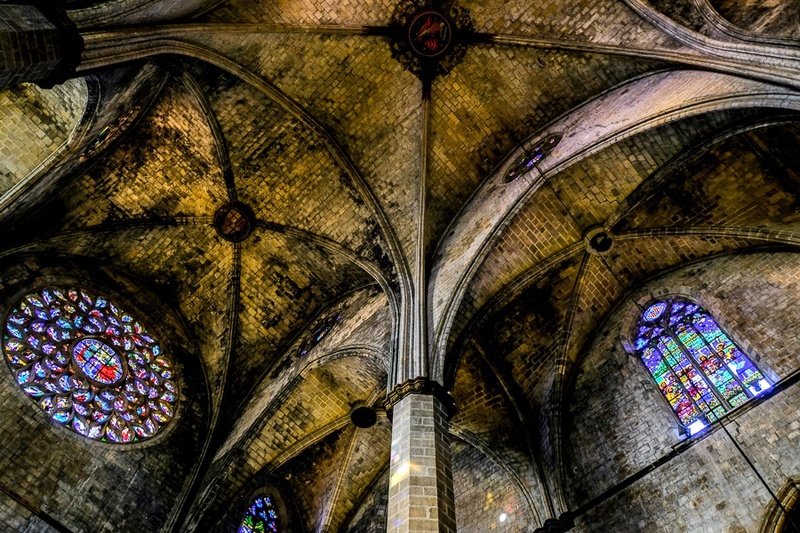 What Is The Santa Maria Del Mar? 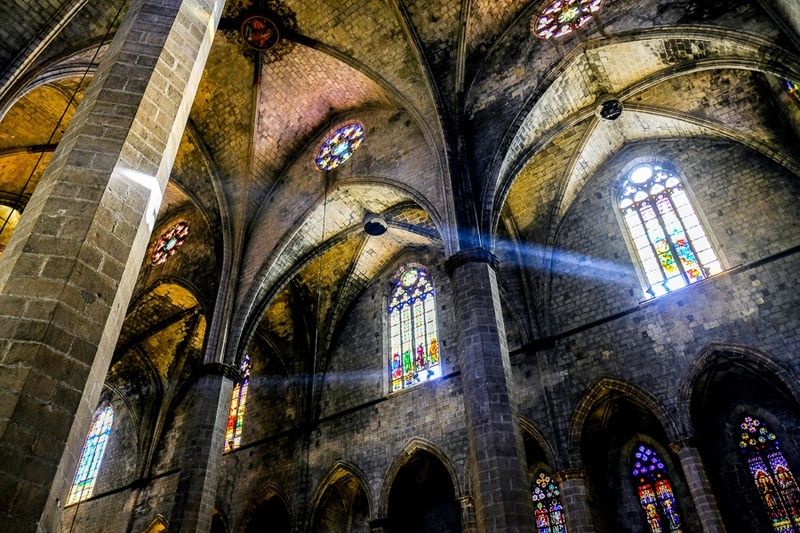 Basilica De Santa Maria Del Mar is a 14th century Gothic style catholic church in Barcelona. 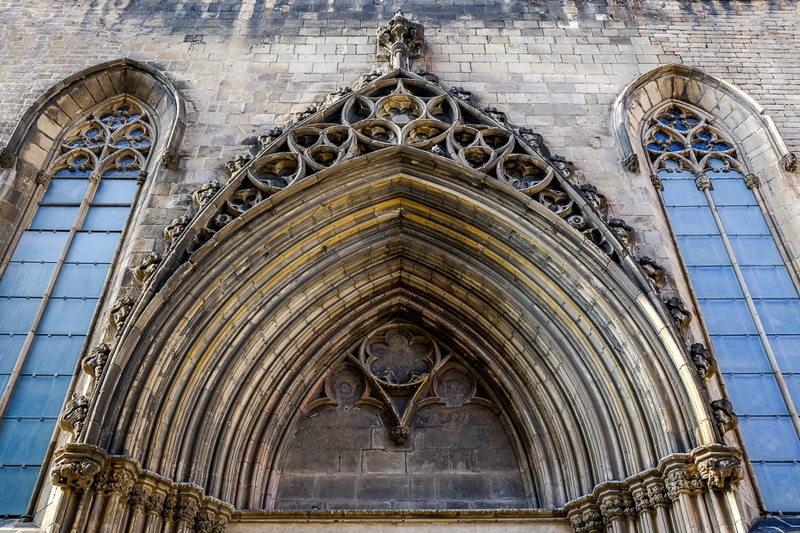 It was built by the Kingdom of Aragon between 1329 and 1383. Over the years, the building has been damaged by fires, earthquakes, and wars, but steady restoration work has kept it looking grand as ever. It’s worth taking a stroll around the outside of the building before going inside, but it’s honestly very hard to take pictures of the outside of this church since it’s surrounded by buildings on all sides and the streets are narrow. The good news is that the inside is better than the outside. The Gothic ceilings and pillars are massive, and you feel tiny when you first step inside and look up. Of course you also have the usual fancy chandeliers and stained glass windows that are typical in these kinds of cathedrals. Compared to the Barcelona Cathedral, I thought this one was better lit on the inside and that made it easier to see what you’re looking at (also easier to take photos). Speaking of photos, there’s no restriction on taking them inside. Entry is free before 1:00 PM or after 5:00 PM, otherwise the entrance fee is €5. There is a guided tour available for €8.50 that includes visiting the rooftop, and it gives you a great 360 degree view of the city. 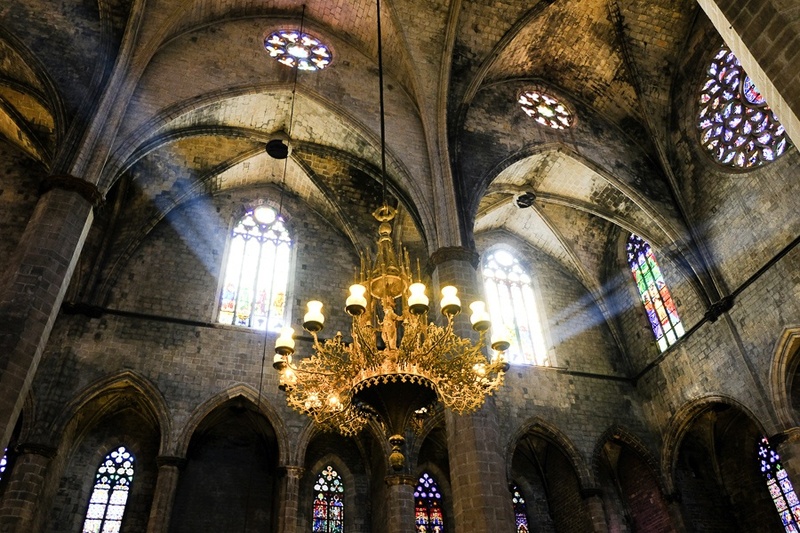 I would budget about 45-60 minutes for visiting Santa Maria Del Mar, although it would be possible to stay longer, especially if you want to explore the rooftop. 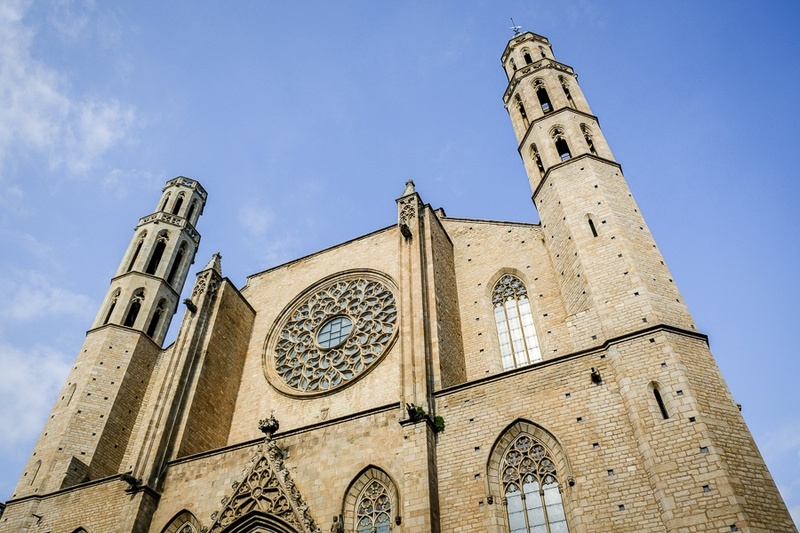 The church is located in the Ribera/El Born area of Barcelona, Spain. You can get there by rail or taxi, or you can walk to it from some nearby hotels. I stayed in the Gothic Quarter at a guesthouse that was just a 5 minute walk to either this church or the Catedral de Barcelona.